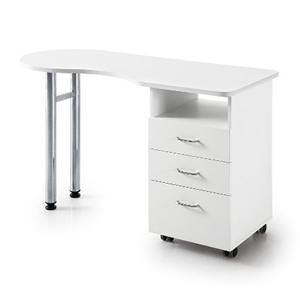 The Vivan White Wooden Manicure Table features a chest of three drawers on castors for easy movement around the salon, adjustable chrome legs for uneven floors and a large, easy to clean work surface. It comes complete with a cable threader and hand rest cushion. Dimensions: Width 100cm, Height 75cm, Depth 45cm.